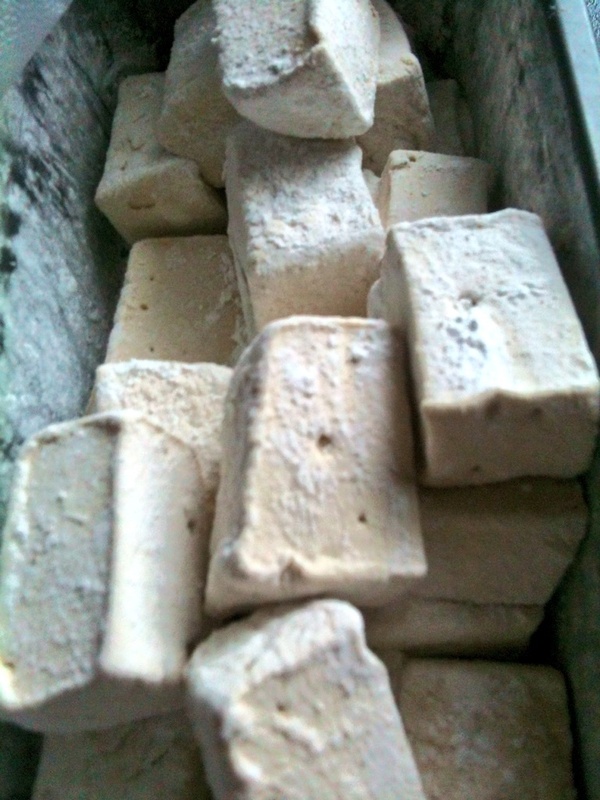 Marshmallows are something I have wanted to try for ages, I just never seemed to get around to it. In truth it was a lot to do with the idea of faffing around with a candy thermometer and the idea of the mess too. As with most things I do it’s never enough to just make plain, simple ones and leave it at that. These stout(STOUT? heck yes! delicious, sweet, cloud-like with a rich stout taste that comes second, they really do work!) The stout flavour take the kiddie confectionery to another, more adult level. This recipe uses stout from my local brewery Williams Bros here in central Scotland. 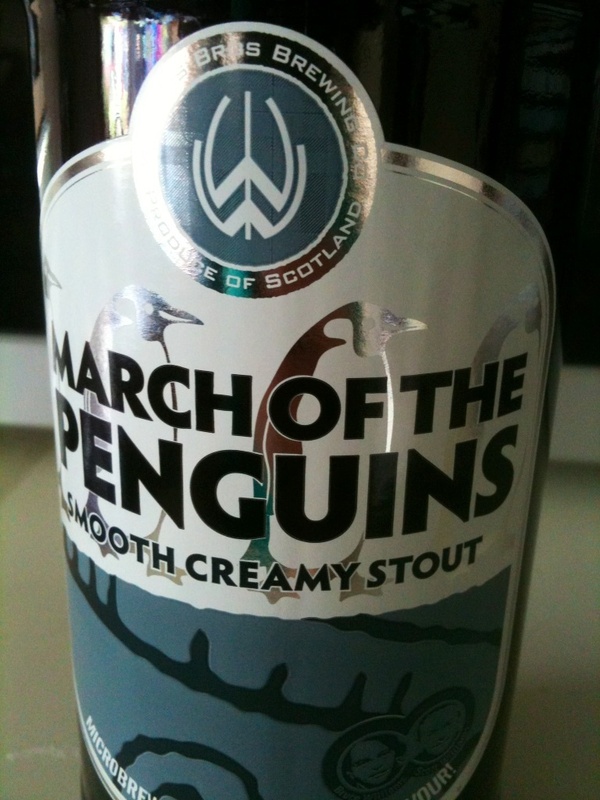 March of the Penguins to be precise, but any dark, rich, malty stout would work, try Guinness if you can’t get my delicious local brew. Everyone here loves them and they would be the perfect thing for Fathers Day. So I urge you to get the pots out and get your mallow on! A sugar/candy thermometer is essential here! A med/large pot, I use one with high sides. This recipe has a tendency to foam a lot so get yourself something kinda big, but not too big that your thermometer doesn’t reach the sugar syrup. A pan, I used a regular loaf pan. That is about perfect size for this amount. Oil the pan and dust with a mix of half icing sugar and half cornflour. Mix together in small bowl and use to dust pan and top of mallows. Then take the stout pour into the bowl of your mixer and sprinkle the gelatine over the top in a even layer. Mix to make sure there are no big lumps. Fit the whisk attachment to the mixer. Put the sugar, stout and golden syrup and salt into your pan, clip the thermometer to the side, if yours is swanky like that, and bring fairly quickly to a rolling boil. You want this stout, sugar syrup to reach 240 on the thermometer, once it’s been boiling for a few ins keep checking, towards the end the temp seems to rise rapidly! Once you’ve reached the 240 take the pan from the heat and start your mixer running, slowly(ish) at this part! Boiling sugar is not something you want splattering over yourself, please be careful. Gently pour the sugar into the gelatine until combined, now you may increase the speed. Let the mixer do it’s thing. The mixture will grow and change to a paler colour. At this stage add the vanilla. 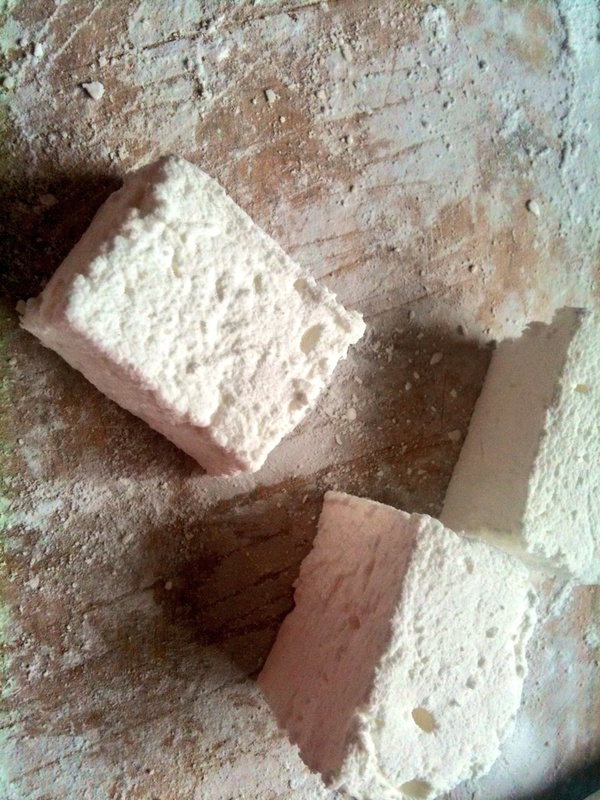 You know the mallows is ready when you can trail mallow on the surface and it retains it’s shape. This can take about 10-12 mins to do. You can feel the side of the bowl for this too, you want it to feel only barely warm to the touch. Once at the setting stage, work quickly with a silicone spatula and pour the mallow into your pan. Don’t worry too much about getting everything or it will start to set! Smooth as much as you can, but again do it quickly and don’t “faff”. Sprinkle a little more icing sugar/cornflour mix over the top and leave to set for at least an hour. 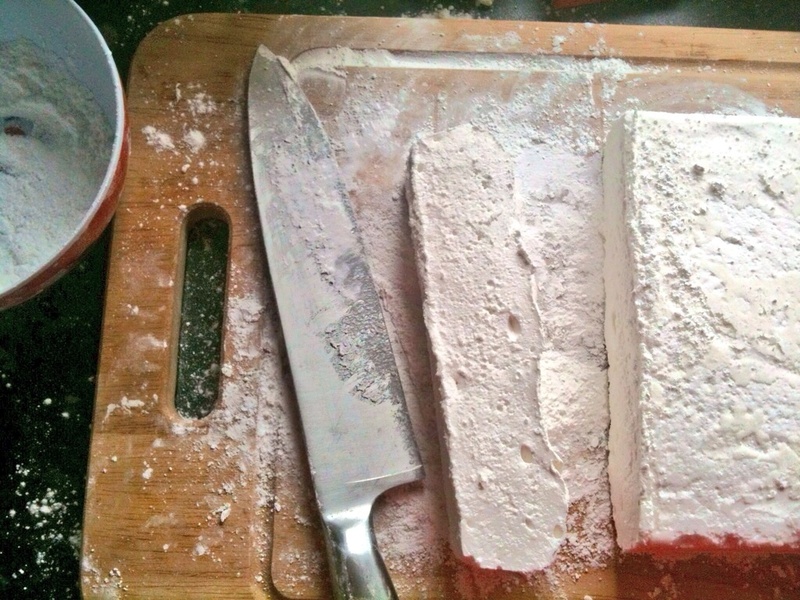 Gently pull the mallow away from the edge of the tin to release and using a knife cut into pieces. Dip your knife into any remaining icing sugar/cornflour between cuts. If it is proving hard to come off the sides, ease a knife down the edge and push a little of the sugar/corn flour mix down the gap. Work your way along the sides of the pan like this and it *should plop out no bother! Ps. Just had a thought, how AMAZING would these be as s’mores?! Yum, I’m off to buy half covered chocolate digestive biscuits and try!